Which of these three players is best set for success at Liverpool? Liverpool midfielder Lucas Leiva has lavished praise on three of his young team-mates, all of whom he believes have bright futures at the club. A number of the Reds’ youth team players have been training with Brendan Rodgers’ side during the international break, and the Brazilian has been hugely impressed with the quality on show. 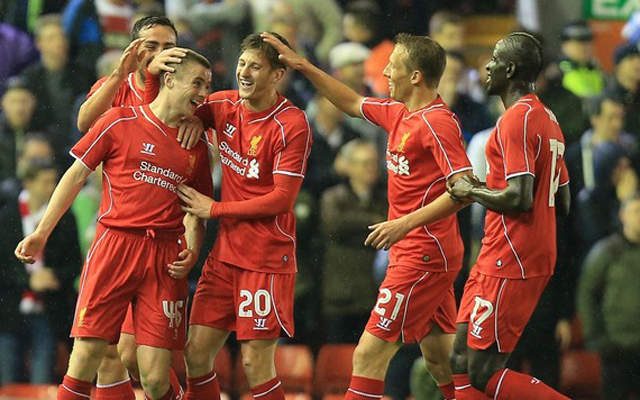 The 28-year-old singled out Jordan Rossiter, Jordan Williams and Sergi Canos for special praise. Rossiter and Williams made their debuts in the Capital One Cup tie against Middlesbrough last year, while Canos is still awaiting his first competitive appearance for the first-team. Rossiter, 18, started and scored against Boro, while Williams, 19, came on as a second-half substitute and scored from the penalty spot as the Reds progressed to the next round. Canos, 18, joined Liverpool from Barcelona in the summer of 2013, and has been one of the stand-out performers for our Under-21s so far this season. Speaking about the trio, Lucas told our official website: “I think since Brendan came in, the young players have been getting a lot of chances, especially training with us. “We can see a lot of young players coming in and a few of them have made their debuts. Jordan Williams and Jordan Rossiter both made their debut this season and there are a lot of other players that come in and train on a daily basis with us, so it’s always good. “We have some good players there, and I think with the way the club is moving, it’s a great opportunity for young players now because we have an experienced group of players but also we have a lot of young players coming in.